Carrots, onion, and asparagus make this a light and healthy springtime dish. The vegetables are roasted to lend a sweet, nutty flavor. They are tossed in a effortless blend of garlic, olive oil, Italian seasoning, salt and pepper. A sprig of fresh rosemary and fresh thyme add a burst of color and infuse additional flavor into every bite. In 30 minutes you have a quick and easy vegetarian dish that is the perfect accompaniment to your favorite meals. When roasting a variety of beautiful vegetables, cooking times vary depending on what you are using. Starchier vegetables take a bit longer to cook, so always check periodically as they roast. Per Serving: 209 calories; 14g fat; 20.3g carbohydrates; 3g protein; 0mg cholesterol; 183mg sodium. Yum! I love that this recipe adds the asparagus to the oven after the carrots and onion have been cooking for several minutes. Everything comes out perfectly roasted at the same time - no mushy asparagus here! this is a great formula to follow when roasted lots of different veg that require different cook times. I can never master roasted multiple veggies and this recipe with cool times and when to add the veggies was so helpful. Everything came out perfectly. I love this recipe and I'm going to make it again and serve for Easter Sunday dinner. In addition to carrots, I added parsnip too. 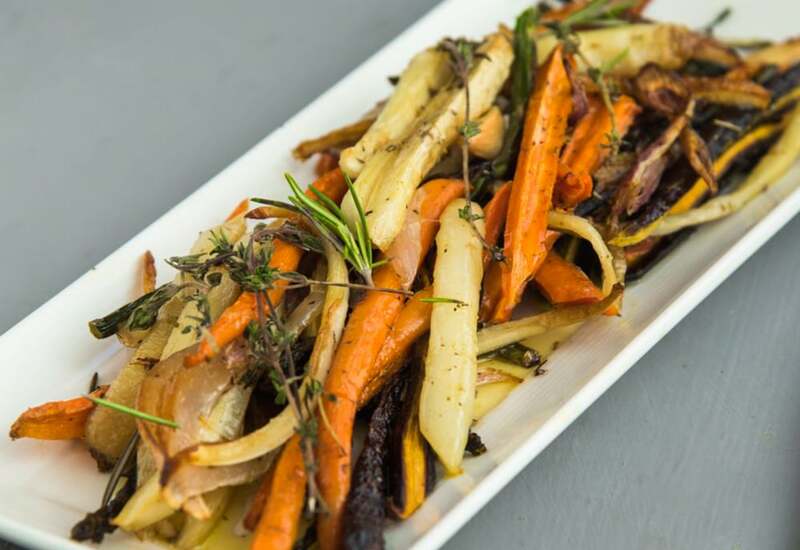 Delicious roasted veggies! Especially the asparagus. I served these alongside a roasted chicken and it was perfect. Going to make them again for Easter. We took the vegetable medley and paired it with red wine braised short ribs. It was a full-bodied dish packed with flavor.